Three Poems is writer/director Jake Houston Harris’ debut short film. The short is exactly as it sounds, a trio of poems, put to a cinematic backdrop which accents Australia’s beautiful landscapes, exploring themes of pride, arrogance, weakness and stubbornness. As the short opens we are greeted to an engaging visual display which draws in the viewer while the words “And then Man created time and spent eternity trying to outrun it” appear on the screen. The ominous music, an original score by Zayd Thring, sets the tone as we enter the first cinematic poem. Before continuing I have to simply say that the score and the music for this film are phenomenal. The short is worth the view to hear the music alone. The first poem, That Ominous Water, has a lyrical tone whose cadenced rhythm draws you in and captures you. A lone woman sits in a row boat whose mooring is coming undone. She has the chance to pull herself in, and instead watches the rope slide off the dock and into the water. The poem starts off with the tone of hopelessness we know the character will feel by the end: “The waters rise about her drift… her old mesh satellite dampens thoughts, unheard, into inauspicious whispers.” The most despairing moment of this short within a short is when you realize that hope is so close, yet despair is so prevalent and looming that there can be no happy ending. What happens on the screen goes hand in hand with the lyrics and they manage to accent each other, while being able to maintain their uniqueness as individuals. The second poem, Rose Arcadia, is a lesson in futility. We join two, presumed, lovers, lying in the dirt, burying each other. It’s easy to understand that this is the end of a relationship, yet the image of them burying each other sticks with me. It reminds me of a quote my high school English teacher used to say many years ago about this form of self-destructive behaviour in literature or any sort of arts medium: “they are immolating themselves on a pier of their own construction.” It’s a haunting quote that has stuck with me to this day and I watch as it plays out with no way to stop it. I can’t even remember the actual poem for this short as the imagery supersedes any lyrical association. The final poem, The Grey, carries a political message around the tensions between European and Indigenous populations within Australia, but it can carry its message to any country. This poem features the most exquisite of the imagery and overall accents the amazing cinematography throughout this entire short. This third poem is a stand-off, and the intensity goes hand in hand with the feelings of desolation, loneliness, poverty, racial separation, and the need to come to terms with differences. Overall this short is highly engaging and is doing quite well on the festival circuits. Harris premiered Three Poems in Manhattan at the 23rd Magikal Charm Experimental Festival and was accepted into the Cannes Court Metrage Short Film Corner Festival in France. It made its Australian debut at the Reel Good Film Festival in Melbourne in April. Three Poems also won the Gold Remi at the Houston Worldfest for Best Dramatic Short. Three Poems is an exercise in surrealist film and is quite experimental, but it works. There are philosophical interludes between the poems themselves, which heighten a sense of pretentiousness to the short, but not in the way where pretentiousness is a bad thing. There is a niche audience for this kind of short film. Many will find it unnecessary and, dare I say it again, pretentious. But that’s the joys of experimental film making, it’s not for everyone, and those that do enjoy it are guaranteed to enjoy this feat. I can’t wait to see what Harris has up his sleeve next. Check out Three Poems on IMDB! 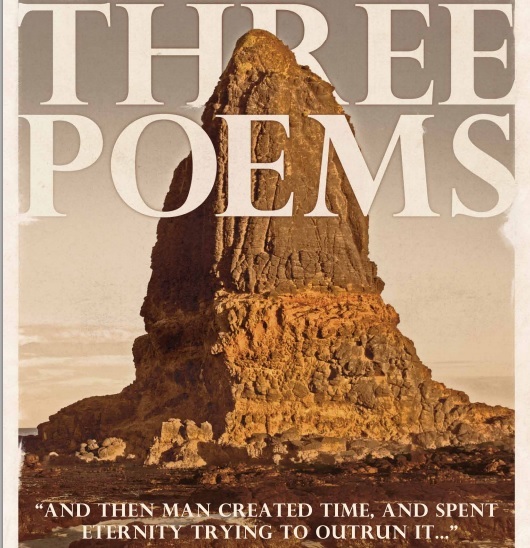 Check out the trailer for Three Poems!